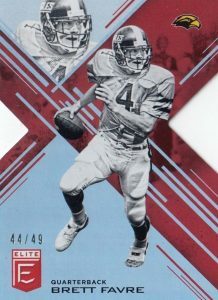 While it is a new product, much of 2017 Panini Elite Draft Picks Football should still be familiar to collectors. The collegiate release kicks off the '17 collecting season for Panini with five autographs per hobby box. 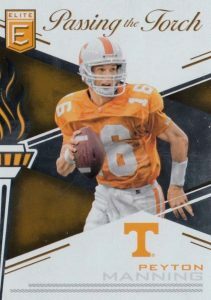 Working with many of the designs and basic elements from 2016 Donruss Elite, the base set features current NFL stars shown during their college days while the Draft Picks subset tackles the key incoming rookie players. Split across Aspirations and Status Die-Cut versions, colorful parallels include Purple, Red, Blue, Gold, Emerald and Teal. Parallels combine to fall in nearly every pack while the Draft Picks Autograph parallel is limited to 99 copies or less. 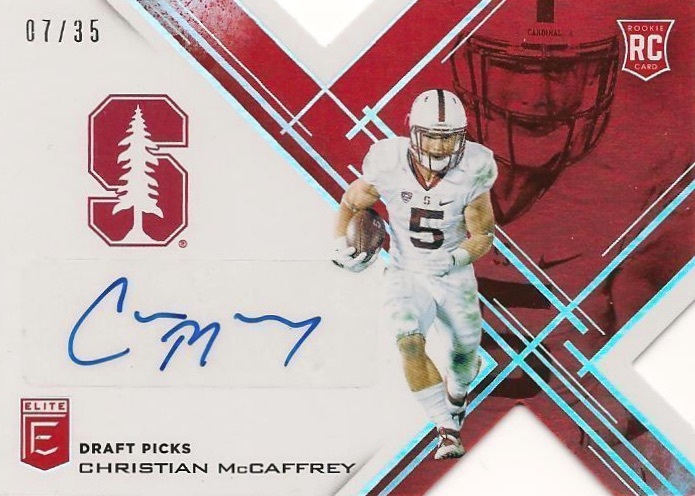 Other signed inserts in 2017 Panini Elite Draft Picks Football include the hobby-only Alma Mater Autographs with as many as 15 College and Pro Football Hall of Fame subjects. A long-time hobby favorite, Passing the Torch Autographs again makes its mark with intriguing pairings. Also offering multiple signers on the same card, the College Ties Autograph insert combines two players from the same school and is only found in hobby boxes. In addition, 2017 Panini Elite Draft Picks Football has standard inserts that average one per pack. ASPIRATIONS PARALLEL CARDS: Orange, Purple #/99, Red #/49, Blue #/25, Gold #/10, Emerald #/5, Teal 1/1. STATUS DIE-CUTS PARALLEL CARDS: Orange, Purple #/99, Red #/49, Blue #/25, Gold #/10, Emerald #/5, Teal 1/1. 174 cards. Shop on eBay. Short Prints noted below: SP = 250 copies or less, SSP = 100 copies or less. ASPIRATIONS PARALLEL CARDS: Orange, Purple #/99 or #/50, Red #/49 or #/35, Blue #/25, Gold #/10, Emerald #/5, Teal 1/1. 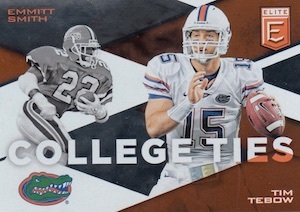 STATUS DIE-CUTS PARALLEL CARDS: Orange, Purple #/99 or #/50, Red #/49 or #/35, Blue #/25, Gold #/10, Emerald #/5, Teal 1/1. cant wait for these to be out — also why doesnt the football at the top of the page show 2017 football yet ? Sweet looking cards. Lots of low numbered parallels…usually crappy players…but hey can’t win them all. Speaking of winning – Trubisky auto /25 Great box! 3 players from San Diego State in the set? Really high quality good looking cards.